Install an application or two and the typical Windows desktop can quickly become a distracting place. There might be animated taskbar buttons, system tray notifications, desktop gadgets and more, each clamoring for your attention, and that can be a problem when you really need to focus on one particular task. You can minimize this to a degree by turning everything off, perhaps, and maximizing your main application window. But the free CinemaDrape provides a more flexible way to focus solely on your areas of interest. Once launched, the program starts by simply blanking your entire screen, so all you can see is its own window. Which does seem a little drastic. But it’s not as bad as it seems, and if you click Close, then press Ctrl+F11, you’ll find you can toggle the effect on and off. Next, launch the application you’d like to focus on -- Word, for instance -- and move your mouse cursor somewhere inside its window. Now press Ctrl+F11 to turn CinemaDrape on, then press Ctrl+W, and the program will display that window alone. The rest of your desktop will remain black, just as before. What’s more, if you now want to view other apps as well, you can repeat this process as many times as necessary. As well as drawing rectangles freehand, with the mouse or a finger (CinemaDrape is Windows 8-compatible). So this isn’t just a more complex equivalent of maximizing an app; you’re able to highlight as many program windows, and general areas of the screen, as you like. The windowing system behind all of this is quite basic. 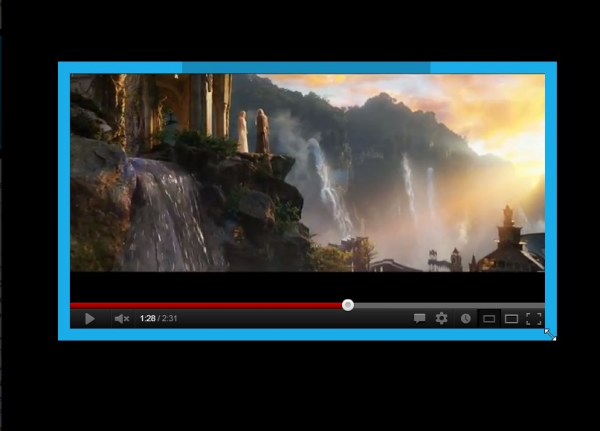 When CinemaDrape highlights an app, for instance, all it’s doing is clearing a rectangle around the application window. If you move or resize the application window later, the viewing rectangle will stay precisely where it was, so you’ll have to adjust that as well. Still, it’s probably unreasonable to expect too much from a free program which comes in the form of a 133KB download. Overall there’s no doubt that CinemaDrape works very well, and the program does provide plenty of configurability. In particular, if you don’t like having a completely black desktop then there’s a simple opacity tweak, which reduces distractions but also allows you to peek at what’s underneath. And we found this to be a welcome compromise which makes the program easier to use while still keeping most of its effectiveness.